SanDisk today announced the availability of 256GB Compact Flash Card, which it claims is world’s fastest high capacity flash card. It also announced faster speeds across all other capacities of the SanDisk Extreme Pro CompactFlash line of memory cards starting from Rs. 9,500 and going all the way up to 1,19,500 INR. The write speed available on these cards is 65 MB per Second Square which is optimum enough to capture up to 4 K video recording. The transfer speed is also quite impressive at 160 MB/second square . The Flash card can deliver fast shot speeds of up to 140MB/s4 for advanced functions such as fast action and continuous burst mode shots. These cards are durability tested and are designed for use in professional environment and include RTV Coating inside for added protection against shocks to further enable them to work in extreme environment. The ability to shoot and store 4K videos directly is something that will be widely appreciated by professional photographers. It is more so important to choose the correct storage as you might only get one chance to capture the shot. The cards also include a one year downloadable offer for RescuePRO media recovery software6, which lets photographers recover their images in case of accidental deletion. 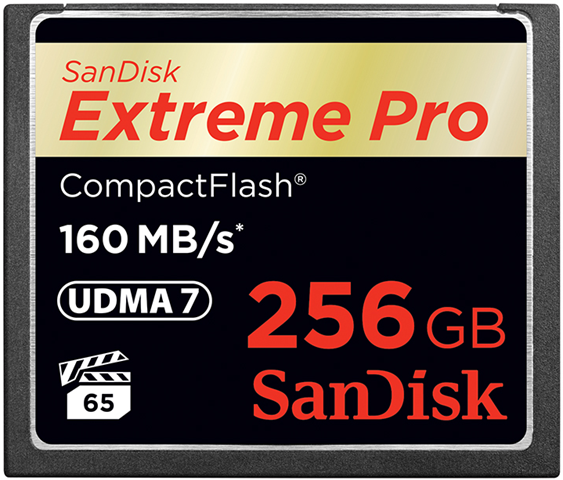 SanDisk Extreme Pro CompactFlash cards are available in capacities of 16GB, 32GB, 64GB, 128GB, and 256GB, and are shipping to India with MRPs of INR 9,500 to INR 1,19,500.